A long, long time ago, in a land far, far away, there lived a boy who – like most boys at some part of their lives – wasn’t completely satisfied with himself. The time was early 5th century, and the land was what we today would call southern India, Chennai. However, at that time the area was known as Madras. And the boy of this story was not a regular boy. Far from it. He was a prince, actually. A prince of the Chadili family. A proud member of the Khsatriya warrior class, which means that he got a better education than most other boys at his age. To say that he had some privileges would almost be an understatement. He was schooled in both the literary arts, as well as the fighting arts, and legend says that the boy particulary enjoyed practising fighting with the staff, which he became quite good at after a while. This was not the life our young boy wanted to live. In fact, it made him quite ill-tempered. So, he started to work on a plan. A plan for how he could escape this square lifestyle for a more exciting one. And after thinking about it for a long time, he finally decided to turn his life around. Well, the plan was quite simple – he decided to change his white layman’s robe for the black robe of a monk. And when his father one day suddenly died, he saw his chance. Abandoning his family’s wealth and possessions, along with the materialistic values he had come to unwillingly represent, he simply went down to the docks and went aboard a ship. A ship that would take him away from his former life, into a new one. A ship that would set him free. The journey was a tough one, but after a long time the ship finally arrived – during the Liang dynasty – in a place the boy knew as Sin-Kalan. The natives called it Panyu. Today we know it as the southern Chinese province of Guangzhou. He had in fact travelled the sea route all the way from southern India to southern China. And he decided to stay here. Quickly the word about the boy (who was now more of a man) spread. His enigmatic personality and amazing knowledge made people around him wonder who this foreign monk really was. But our monk wasn’t about to tell them. His former life was completely dead to him. It wasn’t interesting. What was interesting was how he could get more people to realize that they too could follow his path of rejecting the unnecessary. Everywhere he looked, he saw people who were just like he had been. And this he told them. In fact, our monk became so famous that he was one day invited to the court of Emperor Wu, founder of the Liang dynasty in the south. Normally this would have been a big honor for many people, but to our monk it wasn’t. He had already experienced the life of a royalty in his former home of India, and couldn’t care less. The emperor was very interested in philosophy and very much looked forward to their meeting. 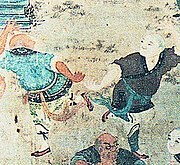 It would take place at his court, in present-day Nanjing, but according to legend it became a very short, and strange, meeting. Because in their conference our young monk exhibited a sort of sharp, shocking behavior that the emperor simply wasn’t used to. In fact, he was quite upset by the manners of the young monk. The emperor practiced excellent outward behavior; he wore fitting robes, abstained from eating meat, built many temples and supported hundreds of monks and nuns. The emperor was in fact very proud of his knowledge of philosophy and religion, and wanted to show this. What a shocking reply! The emperor had often heard renowned masters say “Do good, and you will receive good; do bad and you will receive bad.” But now, this poor foreigner in front of him declared that all his efforts had earned no merit at all! Not wanting to give up just yet, the emperor asked one more question. This stunned the emperor. Other masters had explained that the essence of life was contained in ancient scriptured and doctrines, but this strange monk had just declared that there was ‘no essence at all’! The emperor did not take this meeting lightly, as you can probably understand, and the consequence was that our monk had to leave. Leave the southern kingdom of China and travel north. He travelled over mountains and through woods, crossing cities and provinces. 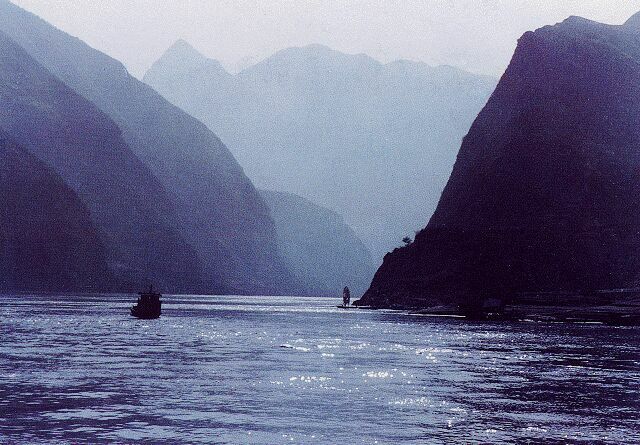 He even crossed the Yangtze River (the longest river in Asia), meeting many different people on the way. Finally, after travelling for longer than he had ever expected, he reached his destination. Known by the locals as Shao Lin Si. Located in the northern Chinese kingdom of Wei. As a way to break intellectual rigidity. However, he had another trick too: He drank tea. Lots of it. In fact, he made all the other monks drink tea too, to sharpen their minds during meditation. This ‘tea sipping’ combined with his very special way of achieving enlightenment through strange verbal games proved to be a big hit. So, as the years passed, you would think he was pretty satisfied with this, right? Well, of course he was, but there was one thing that was bothering him a little. They were weak and frail. They often fell ill. They were even bullied and tossed around by local thugs. In short, it didn’t look good. People laughed at the monks. But our monk strongly believed in the idea that spiritual, intellectual and physical excellence are an indivisible whole necessary for enlightenment, so he had to do something about this. As we already know, he had himself been practising the warrior arts of his homeland since childhood. So he used that experience. Our monk decided to strengthen his fellow monks and disciples by teaching them a set of movements, that he created from his native Indian art of ‘varmakkalai’. These physical exercises would be named “The 18 Hands of Buddha” (Shi Pa Lou Han in Chinese). They contained breathing exercises, stretching exercises, strengthening exercises as well as fighting exercises. And everyone should practise them. Who was this mysterious monk? What were those exercises? Is this story made up? And what has this got to do with Karate anyway? Find out in part 2! Hi jesse! I´m Nicolas from Argentina and I practice Shorin Ryu Shidokan. Could it be you´re talking about Shakyamuni Buddha (AKA Gautama Siddhartta)? I was wondering, if it´s not too much trouble... Since you have (for what i´ve seen)a great knowledge in Karate´s history and rare facts, if you could share with us something related to Shorin Ryu. Although Shorin Ryu is widely known it´s quite difficult to find accurate data about my style trought the internet, especialy regarding kata´s oringins since we have tons of variations (I remember reading your post on that subject). I´m quite intrested about Shotokan also, since Funakoshi and Chibana were both under Itosu´s lineage and we have SUCH differences between styles. I´m aware some of the differences come from political reasons in order for Japan to accept Karate and the physical constitution of Japanese people... Nevertheless I don´t understand why are ther two gojushiho (sho & dai) or why Kyokushin has shushiho wich is supposed to mean the "same" according to Shinkyokushin´s web page from Argentina. Could you share some of you´re thoughts on this topic? I´m sorry if this post is too long. It´s a pleasure to be able read this blog. I learnt a lot thanks to you and some of the blanks I had were filled thanks to your posts. Yours trully, Nicolas. Hi Thomas,No. Both Gojushiho versions exist in Okinawa too, outside of Shotokan. The idea that they were somehow brought back from Japan and planted into Shorin ryu from Shotokan seems a little far-fetched to me. "If Itosu had created it wouldn’t Mabuni or Chibana Choshin one Kata of their styles. I mean both of them were Itosu’s students. "Not all of Itosu's students learned Itosu's full system. For example, Chibana Choshin didn't teach Chinto, Chinte, Jion, Jitte, Jiin, Wanshu, Gojushiho along with some other standard "Itosu-kata".To summarize: Gojushiho was just one of many kata that were codified by Itosu. Today we have two versions: #1. The original version... along with #2. Itosu's version. The same is true for Bassai, Chinto, Wanshu, Kusanku and many other kata too. People just get confused with Gojushiho because they are more widespread (since they got their way into Shotokan) and because they are called Sho/Dai. "For example, Chibana Choshin didn’t teach Chinto"I'm a Kobayashi (Chibana-ha) Shorin-Ryu practitioner and Chinto is part of our syllabus. Our Grandmaster, Hanshi Nakazato, was under Chibana and to my knowledge, was his only instructor. Where would Nakazato learn Chinto if not from Chibana? Thanks a lot Jesse for responding my post. You told me something I didn´t know. As you probably know, Shidokan is the style that Hanshi Miyahira Katsuya stablished (he has the Kancho of Kobayashi Ryu, if I´m not mistaken) and we too practice Chinto (one of my favourites) and a couple of other kata like Matsumora no Passai or Itosu no Passai or Kusanku Sho & Dai... I´ve seen both Gojushiho Sho & Dai and are quite different haha. I clearly see a lot of differences among Shorin Ryu "Styles"... I think the difference lies in the interpretation´s made by all the students that managed to stablish their own schools (I think everything is valid... Karate is Karate and all of us just want to grew up, it doesn´t matter that much although it´s quite interesting!)... what do you think? (I don´t want you to get you in any trouble by stablishing a possition). Actually, I don´t like Kyokushin... I really like Okninawan styles and of course Shotokan makes me very curious... I mean the way they perform their kata is way different from the way we do... slow moves first... fast and powerful afterwards... we tend to keep the same pace (Its been a long time since i´ve written in english (i´m sorry if I can´t be accurate with my writting). Another thing that makes me curious is the difference between Tekki and Naihanchi since is the same kata, why do we have such differences? (I´ve seen Chibana´s performance of this kata and is the same Miyahira and Nakazato do... as well as we...) I know we can´t "answer" this questions but it´s quite intresting to be able to share thoughts on the subject. For what I´ve read you are really intelligent and curious... That´s something I really respect. I love Karate, is a part of my life... so I try to get to know as much as I can about Okniwan culture in order to understand what it is I´m doing. I think politics mess a lot with karate sadly... For instance, Miyahira is very old... I wonder what will happen when he passes away? I will keep on practicing Shorin Ryu´s lieanege... Shidokan is Shorin Ryu... as well as Shorinkan or Kyudokan for instance... We are all the same. Thanks a lot... I will keep on reading your posts. You always give me something to think of. Yours trully, Nicolas. 2010-2,25. tampa florida usa.Oshu !! !karate kata are like musicmozart chopin bethoveen fur elyse. every one play the exact same tune but from his own personnal feeling and perspective.. the exact is the same with the popular music the same song by elvis and the beatles that is the way !! !you are not suppose to be a photocopy of your teacher.for kyokushinkaikan sushiho many kata have the same name but are very different in karate and even in kobudo hakutsuru kata, bo sunakake. seipei from goju and kyokushinkaikan have only the same name but are very different too. in kyokushinkaikan we have shorin kata until black belt. taikyoku, pin an, tekki, than after all the goju kata are welcome, tensho sanchin saifa seiunchin gekisai dai/sho. and also some kata are from kyokushinkaikankan old master like tsuki no kata, yanshu, (garyu mas oyama pen name) and sushiho the last official kata in our org. we have also another version of kanku. and it seems yanshu was borrow or mas oyama lear it from Kuniba Soke his good friends. very interesting subject indeed ,thank you ...Oshu !!! Columbo san. tampa florida usa. @Nicolas Reason why Naihanchi is the same for Kobayashi (Shorinkan), Shidokan and Kyudokan is because Nakazato, Miyahira and Yuchoku Higa all were under Chibana. However, of the three, Higa does has four rare katas not in other Shorin-Ryu syllabus - Aragaki Seisan, Aragaki Unsu (NOT the same one as Shotokan, I might add... VERY different! ), Aragaki Niseishi (Shotokan Nijushiho) and Aragaki Sochin. It is said that he picked these up when he was under Goju master Jinan Shinzato (who trained directly under Miyagi). "Hanshi Miyahira Katsuya stablished (sp) (he has the Kancho of Kobayashi Ryu, if I´m not mistaken)"This is debatable. Although this may seem like a biased point of view (seeing that my original instructor is directly under Nakazato), I believe Nakazato may have the menkyo kaiden for the Chibana-ha (Kobayashi) Shorin-Ryu. IF THERE'S ANYBODY THAT KNOWS FOR SURE, PLEASE LET ME KNOW. @ DrewThere is no Menkyo Kaiden in Okinawa, only in Japan. Transmission is made by issuing a Shihan license. @t Dru (Thanks guys! you´ve been a great help!) One last thing haha: Yup you are right Miyahira, Nakazato and Higa were all students of Chibana that´s why we have little differences (despite a couple of more or less katas according to the style). BUT my doubt regarding Naihanchi/Tekki was between Shotokan and Shorin Ryu... Higa, Nakazato and Miyahira (and if I´m not mistaken Motubo as well since Hanshi Miyahira was a student of his)style´s have very little differences in this kata. I mean... if Chibana and Funakoshi were Itosu´s students why Shorin Ryu and Shotokan have such differences in their kata? Not only in Naihanchi but in Kusanku, Chinto, Passai and so on... haha actually something quite curious to me as well is that Nagamine´s style has a Naihanchi version that is really similar to Shotokan´s version... Clearly I need to learn a lot and dig further haha. Thanks again all of you! And specially Jesse! I would like to confirm there are "Aragaki" Seisan, Unsu and Sochin katas in Kyudokan school. But there is no Niseishi kata in our syllabus.As far as I know it was G. Funakoshi's son who changed so many in former Shorin-ryu (Shuri-Te) of his father creating Shotokan we know today. I read about Aragaki Niseishi from Koryu Uchinadi. Where did this kata surface? Did he learn it through Higashionna? No, from Aragaki Seisho himself; along with Sochin, Unsu, Seisan and some kobudo. Learned something new today.Wow! Did not know about Funakoshi Kenpo. Thanks for sharing that! Hello I'm Shankar from India and I know very well who your talking about Jesse-san. He's called Bodhidharma which roughly translates way of knowledge or something like that if my hindi is correct. He is very famous in India. As matter of fact if I remember correctly he was the one who taught zen buddhism to chinese. Awesome! I love the tales of Tamo!